jade flower ring: local boutique, glasses c/o proopticals. Spent my weekend with family & friends, good food, cocktails and a very hyper-active pug puppy! love the outfit, your top and skirt compliment each other so well! beautiful! Love that skirt and blouse together! Great outfit, the skirt is so cute and will be great for autumn too! I love your boots so much, wouldn't have thought they were fro m&s, I should check out their site more often! such amazing outfit as always!! you hair look fantastic and so sweet! That's such a pretty skirt, I love the colour and the cute little pockets! you look SO good, seriously. i love these photos! This outfit is so pretty, you're amazing at colour co-ordination! this outfit is so lovely! i adore your skirt. how i can't wait for cooler weather...so i can start wearing adorable outfits like this. love the pockets on your skirt, they're so cute! I love the skirt, peacocks! Who would have thought it!!! And the print on the blouse is super duper too. So cute and vintagy! I love these colors. A wonderful transition from Summer to Fall. OMG. I love this outfit, one of my favourite of yours <3 just LOVE every little piece about this. 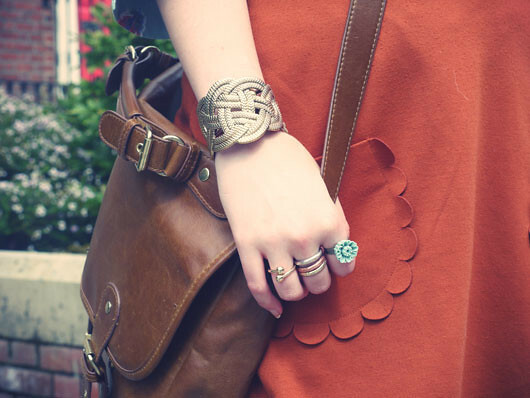 Gorgeous outfit, I love your satchel too :). wow such a lovely outfit! your top is fantastic and I love the details of the pockets on your skirt! I just discovered your blog and I really love your style and pictures! I love your shirt and the cut and colour of your skirt! Gorgeous! As ever you look beautiful, I LOVE that skirt! omg this outfit is perfect!! you look so lovely! just found your blog, it's brill, i have a new post up if you want to take a look!